This Saturday I'm in another craft fair with Debi, one of my downlines. This will be our third time that we both have participated. 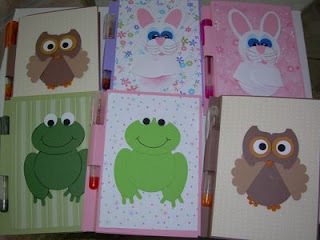 The punch critters shown above are little notebooks that are one of the items I'm selling. As many of you know I really enjoy the Stampin'Up punches. They add an additional dimension to stamping. Hope they give you ideas to expand upon. We are half way through Sale-A-Bration. I hope you have made your lists to get another item or two for free. So far it appears that the Botanical Blooms is number one with Polka Dot Punches a close second. Both the DSP paper and matching ribbon are equally divided.